This Task aims at equipping the H+ and RBV network with innovative tools for the physical characterization of main flow paths. The first set of equipments consist in a digital winch for periodic hydraulic tests to characterize the flow paths and hydraulic head variations in heterogeneous media. This equipment is easy to operate on different sites and boreholes and can provide great insights about groundwater flow properties. In addition, flow dynamics can be monitored by specifically developed active DTS methods (WP 3, Read et al, 2014) or through precise local measurements (Jamin et al., 2015). 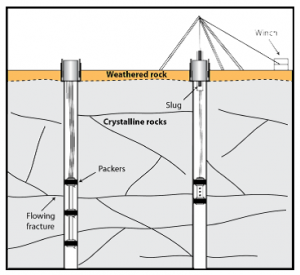 Hydraulic tomography is an innovative method used to determine the distributed hydraulic properties of heterogeneous aquifers. 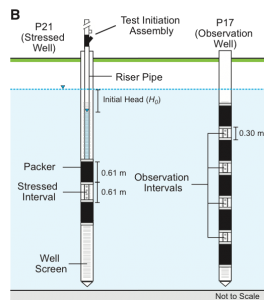 Constant rate pumping tests and hydraulic slug tests are commonly used but some studies have shown that they can be greatly complemented using oscillatory water level variations at different frequencies in the source well. 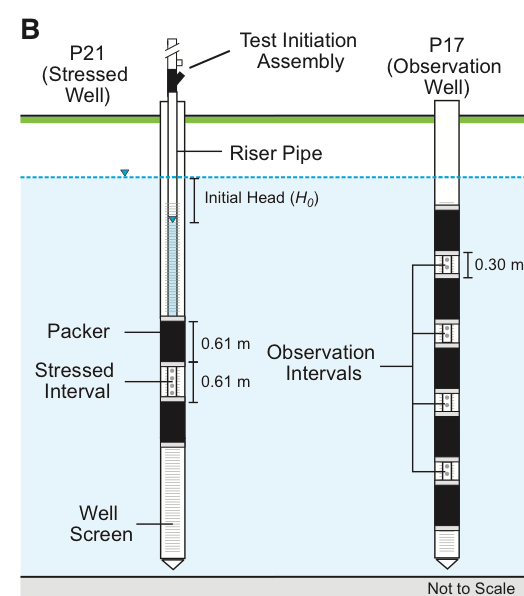 Periodic hydraulic tests are easy detected in the observation well, even for small variations. Working at different frequencies allows also to investigate various scales and the possibility to stress the medium without pumping may be of particular interests when the permeability is relatively low or when the aquifer is contaminated. 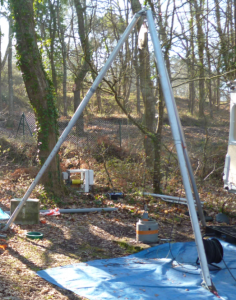 A periodic winch prototype has been developed in Geosciences Rennes (fig.1) which allows accurate sinusoidal hydraulic head variations at different frequencies and amplitudes. 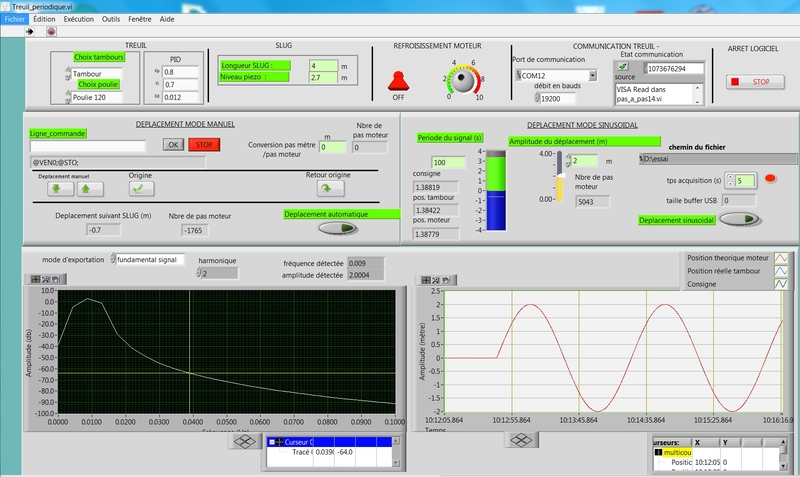 A friendly user interface developed under the Labview software (fig.2) allows to control the winch and to visualize the periodic signal in real time. This oscillatory system induces an easily recognizable periodic signal in the pressure measurements at the observation wells (Fig.3 and Fig.4). Preliminary tests with this equipment were carried out in a highly heterogeneous and anisotropic granular medium at the Saint Lambert site in Canada (Fig. 1, 3). Tests at different frequencies have demonstrated the interest of the method and the very good quality of the signal obtained Fig. 4). 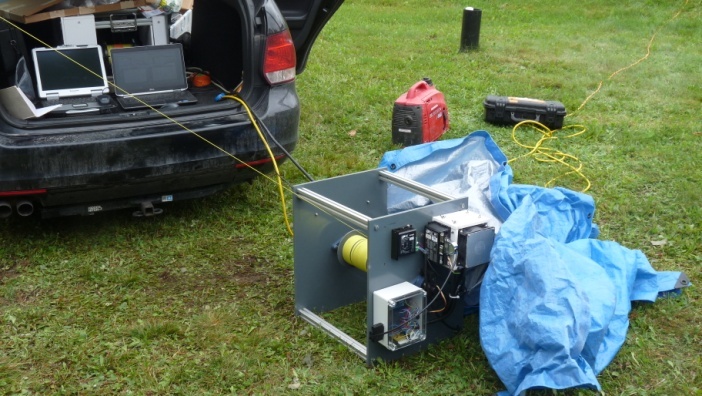 Collaborations are envisaged between the University of Rennes and the INRS Quebec (within the framework of the LIA, Laboratory International Associated) on the use of this equipment to improve the characterization of the hydraulic properties of the alluvial aquifer. In addition, this method has been used to improve the hydraulic characterization of an experimental site at the Ploemeur aquifer (H+ Network) in collaboration with Matt Becker (University of California, USA) and to test the sensitivity of the method to the complexity of the different flow paths. 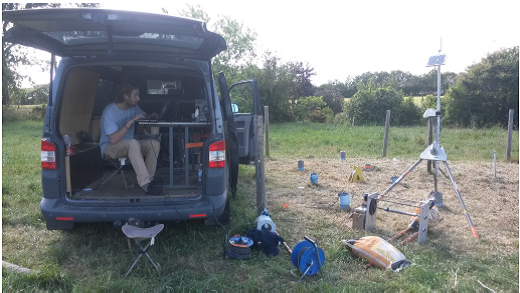 The method has been also applied at the Kerbernez catchment (RBV network) to characterize the main flow paths properties at the transition between the weathered saprolite and the fractured granite. 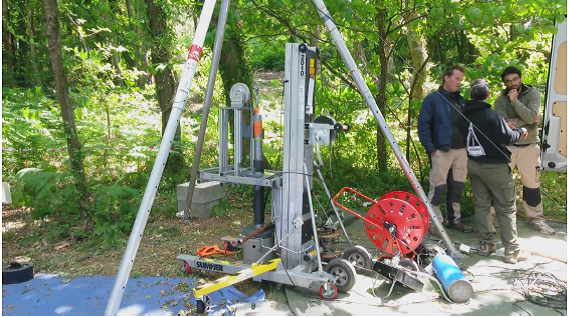 The experiments benefited from an interesting setup with many boreholes drilled in a small area and at depth ranging from 5 meters to 15 meters. Finally the method has been used to study the at Ploemeur (H+ network). Indeed, the variations in pressure induce changes in the opening of the fractures, and this deformation can be measured at surface (see WP 2.2). Due to the frequency nature of the signal and the appropriate treatment, low amplitudes of inclination due to hydraulic forcing could be detected and interpreted in terms of mechanical properties and behavior of the fractures (Schuite et al., JGR submitted). Fig 5: Hydraulic tomography tests with a periodic winch at St Lambert site in Canada.